Researchers from Case Western Reserve University realize cat-like 'hearing' with a device that is 10,000,000,000,000 times smaller than human eardrum. Cleveland-researchers at Case Western Reserve University are creating atomically thin "drumheads" capable of receiving and transmitting signals across a radio frequency range much more than what one can hear with the human ear. On the other hand, the drumhead is tens of trillions times (10 followed by 13 zeros) smaller in volume and 100,000 times thinner than the human eardrum. The progress will probably add to the creation of the next generation of ultralow-power communications and sensory devices smaller and with greater detection and tuning ranges. "Sensing and communication are key to a connected world," said Philip Feng, an associate professor of electrical engineering and computer science, and corresponding author on a paper about the study published March 30 in the Science Advances journal. "In recent decades, we have been connected with highly miniaturized devices and systems, and we have been pursuing ever-shrinking sizes for those devices." The difficulty with miniaturization: Also realizing a wider dynamic range of detection, for small signals, such as vibration, sound, and radio waves. In the end, we need transducers that can handle signals without losing or compromising information at both the 'signal ceiling' (the highest level of an undistorted signal) and the 'noise floor' (the lowest detectable level). While this study was not aimed toward particular devices presently on the market, researchers said, it was aimed at measurements, limits, and scaling which would be crucial for fundamentally all transducers. These transducers may be developed over the next ten years, but for the present, Feng and his team have already established the capability of their main components-the atomic layer drumheads or resonators-at the smallest scale achievable so far. The research signifies the highest reported dynamic range for vibrating transducers of their type. Thus far, that range had only been achieved by much larger transducers working at much lower frequencies-like the human eardrum, for instance. What we've done here is to show that some ultimately miniaturized, atomically thin electromechanical drumhead resonators can offer remarkably broad dynamic range, up to ~110 dB, at radio frequencies (RF) up to over 120 MHz. These dynamic ranges at RF are comparable to the broad dynamic range of human hearing capability in the audio bands. Feng said the answer to all sensory systems - from naturally arising sensory functions in animals to advanced devices in engineering - is that preferred dynamic range. Dynamic range is the ratio between the signal ceiling over the noise floor and is typically measured in decibels (dB). Human eardrums typically have a dynamic range of about 60 to 100 dB in the range of 10 Hz to 10 kHz, and human hearing rapidly drops outside this frequency range. Other animals, such as the beluga whale or common house cat can have comparable or even broader dynamic ranges in higher frequency bands. The vibrating nanoscale drumheads built by Feng and his team are composed of atomic layers of semiconductor crystals (single-, bi-, tri-, and four-layer MoS2 flakes, with a thickness of 0.7, 1.4, 2.1, and 2.8 nm), with diameters only around 1 µm. They build them by exfoliating separate atomic layers from the bulk semiconductor crystal and using a mixture of micromanipulation and nanofabrication methods to suspend the atomic layers over micro-cavities pre-defined on a silicon wafer, and then making electrical contacts to the devices. 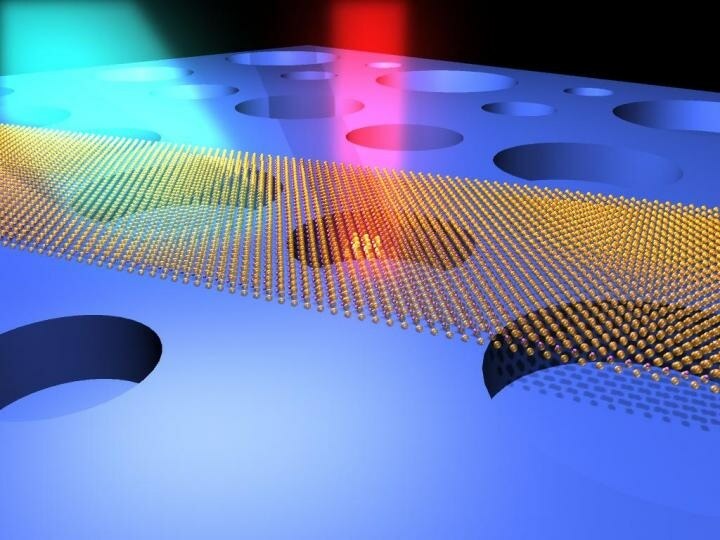 Additionally, these atomically thin RF resonators being examined at Case Western Reserve display superior frequency "tunability," meaning their tones can be controlled by stretching the drumhead membranes using electrostatic forces, akin to the sound tuning in much larger musical instruments in an orchestra, Feng said. The research also exposes that these extremely small drumheads only require picoWatt (pW, 10-12 Watt) up to nanoWatt (nW, 10-9 Watt) level of RF power to withstand their high-frequency oscillations. Not only having a surprisingly large dynamic range with such tiny volume and mass, they are also energy-efficient and very 'quiet' devices. We 'listen' to them very carefully and 'talk' to them very gently. The study has been financially supported by the National Academy of Engineering Grainger Foundation Frontiers of Engineering Award.